Kaylee started working at Live Oak in June of 2018. Kaylee has a Bachelor of Business Administration in Human Resource Management from Tarleton State University. Kaylee has 5 years experience in the Veterinary industry as an accountant. She recently moved to Joplin, Texas from Fort Worth, Texas with her husband Shawn and their 2 Labradors Cruz and Oprah. When Kaylee isn't working she enjoys cooking and spending time with her husband, family and dogs. Carolyn is a Jacksboro native and has an associate degree in business mid-management from Amarillo College and then later attended the University of Houston. She spent most of her career in real estate and oil & gas, but retired from AT&T as a customer service representative. She joined the clinic in February as a receptionist. Georgia Peaches is a long haired miniature dachshund who rules at her house. Tami started working for Live Oak in September of 2018. Tami has 28 years experience in the Veterinary industry as an office administrator. Tami has one son named Jeff. She recently moved to Texas with her husband Barry and they're working on building their dream home in the country. When Tami isn't working she enjoys spending time with her husband and their 2 cats, 3 dogs and lamb Carolyn. She also enjoys fishing, road trips and off-roading in her Jeep. Being raised with a ranching background, I have always had an interest in animals. I received my Associates Degree right out of high school, at that time becoming a Registered Veterinary Technician. Keeping my registration up with continuing education, I have gone from being a RVT to a Licensed Veterinary Technician. I feel blessed to be in a profession I truly enjoy. My husband and I have 2 sons. Hobbies include baking and making jelly with my mother and spending time with granddaughter Willow. I am also an active member of Live Oak Baptist Church. I was born and raised in Princeville, Illinois. Growing up, I was very active in 4I-1 and FFA. I showed horses and was president of my FFA chapter. I attended Black Hawk College in Kewanee, IL where I received my Associates in Equine Science and Associates in Horse Science Technology. There, I was a member of the Intercolligent Horse Judging team and very active in ropings and barrel races that we hosted. Upon graduating in 2010, I took a job with Matt Miller Cutting Horses in Poolville, TX. After 2 years of hauling with them, I moved to Jacksboro and started working for Live Oak in June 2012. I am CVA certified Level 1 and am currently continuing my education online. The vet clinic, the clients and the patients are family to me and a definite home away from home. In my free time I enjoy riding horses, working cattle, shopping (of course) and spending time with friends. I have 3 pets. A perfect dachshund named Khloe, a black mouth curr dog and a cat. 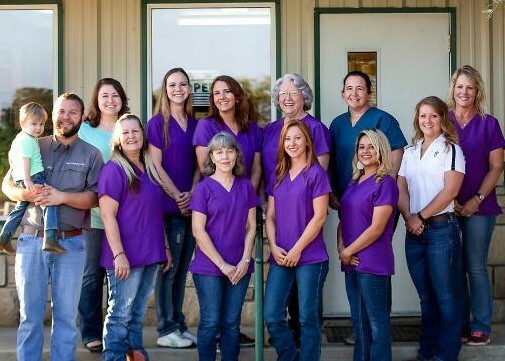 Brittany has been at Live Oak Veterinary clinic since October 2015. Love my job helping the animals in any way needed. I am currently working toward my CVA. I was born in Fort Worth, TX but have lived in the country my whole life. I grew up showing pigs, raising ducks and chickens, riding horses and working cows. I have 3 beautiful children: Jackson, Kaydence, and Amiya who are my world and I love being able to share this experience with them. Susan started working at Live Oak in August of 2017. Susan started out as a receptionist and was moved to a tech due to her background as a tech for 10 years. Susan is very hands on and hard working. She enjoys spending time in her green house and with her kids and husband on their ranch. Maria started working for Live Oak in January of 2016. Maria is well known for her love of all her clients and their pets. Most of the clients get excited to see Maria when they come in for grooming or boarding because she treats them as her own pets. When Maria isn't working she enjoys spending time with her kids Uriel and Kimberly and their dog Callie.